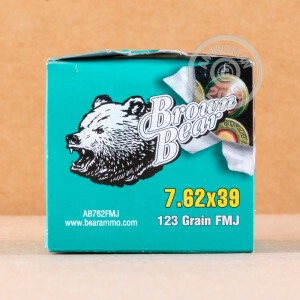 Brown Bear ammunition in 7.62x39mm is quite similar in ballistic terms to the military loads the SKS and AK were originally designed for and delivers good accuracy at medium range. Each round in this bulk priced case of 500 fires a 123 grain full metal jacket bullet at 2,430 feet per second. 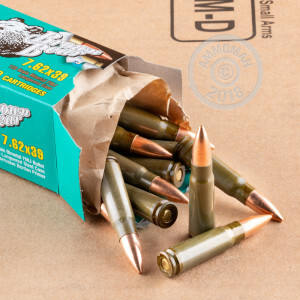 This ammo uses non-corrosive Berdan primers and non-reloadable steel cases. All orders over $99 at AmmoMan.com ship for free--that includes cases like this one! I have shot a couple hundred rounds through my AR with only a few misfires. Which I am blaming on the gun light striking the primer. Feeds perfectly and ejects perfectly. I dialed in a new scope with this ammo and shot 1/2 inch groups at 50 yards. I didn't have time to take it out any further . I was actually very impressed with the accuracy of these rounds. I am looking forward to taking some long shots with it later.